BlackBerry Priv's rear camera to sport Sony's IMX230 21MP sensor? 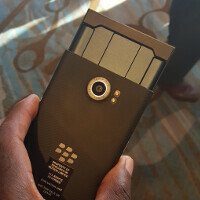 While we have seen a number of leaked images allegedly showing off the BlackBerry Priv, and have passed along the rumored specs of the device, the truth is that there might be aspects of the Android slider that we don't know much about at all. We have seen at least two different pre-production models, each sporting a different rear camera ring. The latest image shows the Schneider-Kreuznach brand on the camera ring, with "18 Megapixel" written on the bottom. Again, these are all pre-production units. And while we don't want to repeat it, we do so for a reason. According to a tweet sent out by tipster/journalist @Ricciolo1, the rear camera on the Priv will employ a Sony IMX230 sensor. This is the same sensor used by the Motorola Moto X Style for the 21MP camera on its back. If this rumor turns out to be legit, it would mean that we should expect the Priv to carry a 21MP rear camera, up from the 18MP that seemed a sure bet as recently as yesterday. This actually could have wide spread implications if true. It would mean that all of the rumored specs that have been disseminated to this point could be dated. Our best bet is to wait for BlackBerry to unveil the phone, which hopefully will happen soon. With the phone unannounced, we recommend taking this story with the proverbial grain of salt. Everyone's right, the sensor is definitely higher than the 18 mega pixels, no pictures are the match for their sensors. The 41MP sensor of the Lumia 1020 would be unbeatable if paired with modern OIS, auto focus and a modern processor that can handle all the data it collects. Well it's a start. Blackberry may actually have a decent camera for once. Considering that back when BlackBerrys ruled, most places didn't even allow camera phones. Most, if not all, their early models were offered without cameras so it's not like they really placed a big emphasis on their photo prowess. I know the times have changed but you can't really fault BlackBerry for crummy snappers, their customers didn't really care if they had a camera or not. True that would hold back in the day. Times have changed. Phones like the Note have several productivity features and still manages to have an excellent camera. It's not about productivity features but also quite a few work places contain sensitive data and as such no cameras are allowed, cellphones cameras included. The only thing that matters are the images that the phone will produce. I'm sure they'll be just fine. Wait for production results everybody. Too bad its a mediocre camera. Early reviews suggest it. That was a PRE-PRODUCTION model. Nothing on that handset was finished. It even said so in the article you're referring to. Yes, but how much can it improve is going to be the question. Gonna have to wait and see. Could be 18MP Sony IMX118 or Aptina AR1820HS. If BB upgraded tha hardware, i hope they give a fingerprint in the power button like sony. http://www.gizmochina.com/2015/04/06/blackview-alife-s1-features-a-powerful-18mp-samsung-isocell-cmos-camera-sensor/ Could be a Samsung sensor too, considering their good ties with BlackBerry. "This actually could have wide spread implications if true. It would mean that all of the rumored specs that have been disseminated to this point could be dated. Our best bet is to wait for BlackBerry to unveil the phone, which hopefully will happen soon." What I've been saying all along. We should all wait until BlackBerry officially releases the handset. What fun is that for the trolls? True that, lol. They'd have no fun at all without their "speculation". That takes the fun out of it? A higher MP camera is great as long as it does not lower the 4K recording time. I do wish they would make a Silver edition like the Passport to truly make this a high-end phone.